Know yourself. Nothing in excess. Give a pledge and ruin is near. These are the words inscribed on a stele just outside the Temple of Apollo at Delphi. Stunning in their simplicity, these Maxims have survived the test of time. Even today, they cause the reader to pause and think about what such short, poignant phrases mean. 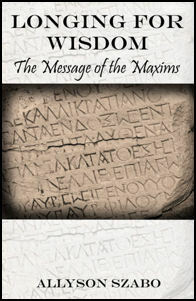 For those who study Hellenic Polytheism, either in historical or modern religious context, the Delphic Maxims are of great import because they hold a key to understanding early Greek thought. Delving into both the history and the current application of 34 of the Maxims to the creation of personal ethics and morals, Allyson Szabo provides us with a path to personal growth and understanding of the world around us. About the author: Allyson Szabo is a middle-age woman with an unusual family. She started out life in a family devoted to atheism. During her teen years, she spent a lot of time investigating the mainstream religions, including Catholicism and Judaism. At 19, she met and became involved with Lord Davydd, an Initiate of Alexandrian Wicca. He was her teacher and mentor for 12 years, and remains a close and intimate friend. Through their years together, Allyson learned much about Wicca, mythology, and the history of religion in general. When she struck out on her own, she realized that what she was practicing could no longer be considered Wicca, regardless of how proud she was of her Degrees. In 2007, she ran into a ragtaggle group of Hellenic Polytheists on the Neokoroi and Neos Alexandria message forums, and discovered a strong interest in all things Greek. Today, she lives in chaos with her unconventional family. They are preparing for a move to the wilds of New Hampshire, where she hopes to turn out more books! Longing for Wisdom can be purchased in paperback through Amazon here, and through Barnes and Noble here. It is also available for the Kindle and Kindle app here. All of the proceeds from Longing for Wisdom – as well as many of the other volumes in the Bibliotheca Alexandrina series – will be used to help promote the revival of the worship of the Greek and Egyptian Gods, with a portion of the proceeds given to a worthy charitable organization in their name. So, not only will you be getting an informative book about the Delphic Maxims – but your money will be going to do good work and help the revival of ancient polytheistic religions. ATTENTION BOOKSELLERS: If you would like to carry Longing for Wisdom in your store please contact us. We are willing to sell you copies of the book at a significant discount in order to make it easier to distribute Longing for Wisdom as widely as possible. Please direct any inquiries to baeditor@gmail.com for more details. Reviews can be found at Rending the Veil, Shelfari, Sequential Tart, GoodReads, A Quiet Patch, LibraryThing, and Myth, Magic and Mundanity. Also check out Star’s Reading Blog, The Druid Network and Pagan Book Reviews.